They were married for over two decades but Kris Jenner is doing her best to be alright with her former husband moving on - even if it is with her close friend. The 58-year-old Kardashian matriarch has reportedly has been crying herself to sleep after finding out that Bruce Jenner has moved on with her pal and ex-assistant Ronda Kamihira. 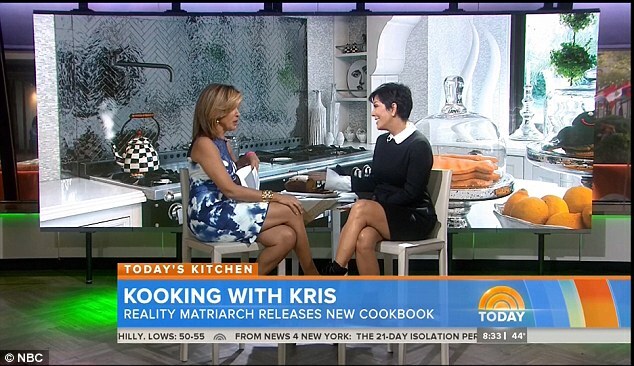 However, on Monday - just three days after the dating news was revealed - Kris was doing her best to put on a brave face when asked about the new romance on the Today Show. When asked by host Hoda Kotb how she felt about her estranged partner moving on so close to home, the Keeping Up With The Kardashians star said she just wanted Bruce to be happy. Kris said, without mentioning Ronda by name: 'I just want him to be happy, I don't care who he goes out with. 'And I don't know who he is dating, he doesn't check in with me and give me a play by play, but it's his life and you just want the guy to be happy. People was the first to report on Friday that the former Olympian was dating again and was dating his ex-wife's longtime friend. Bruce was seen with Ronda, who is 51 and divorced, in at the Elton John concert on October 4. Ronda, a former neighbour of the Jenners in Hidden Hills, has two daughters named Maddy and Spencer who are very close to Kendall and Kylie.